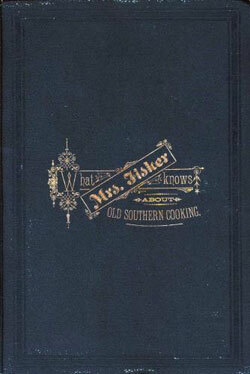 Abby Fisher’s cookbook, What Mrs. Fisher Knows About Old Southern Cooking, Soups, Pickles, Preserves, Etc. published in 1881, is the oldest known cookbook written by a former slave. Abby (maiden name unknown), was born in 1832, and grew up in the plantation kitchens in South Carolina. There she honed her culinary skills and became a phenomenal cook, which catapulted her to success later in life. Abby Fisher expertly blended African and American cultures by combining the foods and spices from two continents. Her unique dishes with their distinctive flavor represented some of the best Southern cooking of the day. At the insistence of her friends and patrons to record her “knowledge and experience of Southern cooking, pickle, and jelly making” Mrs. Fisher authored a cookbook. Since she could neither read nor write, her recipes were carefully described to writers who compiled them in the cookbook under her name. Little is known of Fisher’s life after the publication of her cookbook. In 1984, just over one century after its initial appearance, a volume of the cookbook was rediscovered and put up for auction at Sotheby’s in New York. The cookbook was acquired by the Arthur and Elizabeth Schlesinger Library on the Harvard University campus. In 1985 Applewood Books reprinted What Mrs. Fisher Knows About Old Southern Cooking, Soups, Pickles, Preserves, Etc., making her recipes available to a new generation of chefs and cooks. Tricia Martineau Wagner, African American Women of the Old West (Guilford, CT: TwoDot, an imprint of The Globe Pequot Press, 2007); Abby Fisher, What Mrs. Fisher Knows About Old Southern Cooking, Soups, Pickles, Preserves, Etc.